Totally Natural and Simply Delicious! Here is an extremely simple yet delicious and healthy snack you can prepare in minutes with no cooking or heating involved! 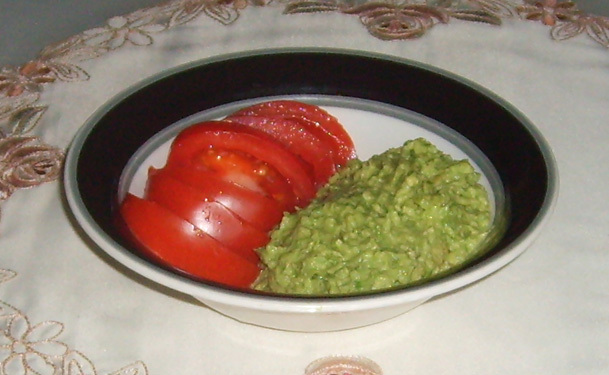 It's one of my favorites and is simply called the raw tomato and avocado dip. All you really need is a fresh tomato and a ripe avocado and you're set. Those are the two main ingredients. Whether you season it or not is your own affair. There are various ways to prepare it, but my favorite is to simply cut up the tomato into slices, put that into a bowl or plate, and then peel, cut, and mash the avocado into a dip using a fork, and put that side by side with the tomato. And it's done! What could be simpler! If you don't want to bother mashing the avocado, simply cut it into large strips and pair and eat it with the tomato slices. It's actually less messier this way, but then it won't be a dip anymore. For more flavour you can add spices or your favourite seasoning, but being a raw veagan, I usually chow it down as is. I don't even use a fork! I just dip the tomato slices in the avocado mash using my hands and eat away! I can eat this two or three times a day and never get tired of it. Tomatoes and avocadoes are two of the healthiest vegetables/fruits you can eat in their raw state. Both contain important minerals and fats that the body readily uses or assimilates. And the great thing is that they're both tasty, delicious, and filling! Color-wise, the red and yellow-green are naturally balancing or complementary. In the winter I buy the greenhouse tomatoes which have less chemicals or pesticides and which are tastier -until the spring when I plant and grow them myself in my garden. If you're lucky enough to be in a warm clime, you can grow your own tomatoes(and avocados) year-round without worrying about pesticides or GMO's. Avocadoes have a thick hard skin which usually protects them from spraying or chemicals, so that there is not much difference(except perhaps the state of the soil they're grown in) between the organic and non-organic ones. Make sure you wash all your produce before eating it. Raw mango and avocado is another favorite snack of mine. Simply peel the mango and slice it and put it into a bowl or plate. Do the same with the avocado and then eat them together -a slice of mango with a bit less avocado. You'll be surprised at how delicious this simple combination can be. And it's extremely healthy as well! This is my favorite salad. Four simple basic ingredients: lettuce, tomato, avocado, and mango. It blends greens, fats, and fruits into an extremely healthy and super-delicious meal. Pick your favorite lettuce(mine is the red-tipped leaf lettuce because of its softness and color): wash, de-stem, shred(I do this with my hands), and place in a large bowl. Add two or three ripe tomatoes(wash, slice, and cut or break into bits). Garden tomatoes are best. If you buy them at the grocery, you may want to remove the peel, as it can sometimes be hard or coated. Add one large or two small ripe avocadoes: peel, slice, and chop into cubes or mash with a fork and add to mix. Add a whole mango: peel, slice, and chop or mash and add to mix. Mix everything(I use my hands) and that's it! Optional: for extra taste or zing add chopped onion, pepper, apple cider vinegar, squeezed lemon, or whatever else suits your fancy!